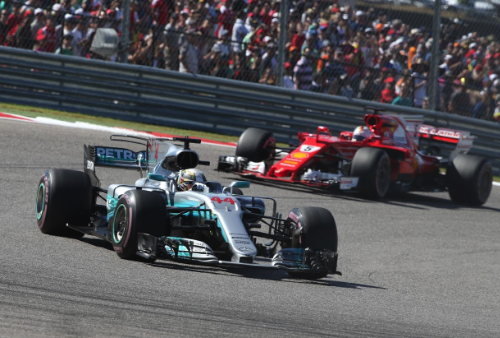 Lewis Hamilton won today's United States Grand Prix in Austin, TX in his Mercedes GP, over Sebastian Vettel in the Ferrari in second place, 10.1 seconds behind, and his team mate Kimi Raikkonen in third place, 15.7 seconds behind the winner. The win is Hamilton's sixth US Grand Prix win, and 62nd career win, and his his ninth win of the 2017 season. Mercedes Grand Prix clinches the 2017 Contructors Championship with three races remaining. Hamilton leads the Drivers Championship by 66 points over Vettel. Max Verstappen (16.758s), given a five-second penalty for going off-track in his last lap pass of Raikkonen, religating him off the podium to fourth place in his Red Bull, followed by Valtteri Bottas (34.967s), in the second Mercedes was fifth, Esteban Ocon (90.980s) in the Force India-Mercedes was sixth, new Renault-man Carlos Sainz (92.944s) was seventh in his debut for the French manufacturer, Sergio Perez (1 lap) in the second Force India was eighth, Felipe Massa in the Williams-Mercedes was ninth and Daniil Kvyat in the Toro Rosso-Renault was in the final points paying position in tenth place. Before the start, Hamilton sat on pole, with championship rival Vettel on the outside of row one, Bottas and Ricciardo on row two, Raikkonen and Ocon on row three, Sainz and Alonso on row four, Perez and Massa rounding out the top ten - Verstappen with his grid penalties starts in 16th. Rain fell earlier in the day, but for the start the sky was clear and sunny. The top nine starting on ultrasoft tyres, Massa in tenth on soft tyres. At the apponted time, the drivers completed the formation lap and lined up on the grid, the lights went out and the race started with Vettel taking the lead from Hamilton, Bottas, Ricciardo, Ocon, Raikkonen, Sainz and Alonso. On the first lap Alonso passes Sainz for seventh. On lap 2 Ricciardo and Bottas battle for third place going through the esses side-by-side, Bottas keeping the position. Verstappen is up to 11th. Raikkonen passes Ocon for fifth place. Hamilton sets fast lap at 1m40.945s. Verstappen passes Perez for tenth. On lap 3 Vettel sets fast lap at 1m40.654s. On lap 4 Ricciardo and Bottas battle side-by-side in the esses again - Raikkonen closes on the pair. On lap 5 Hulkenberg retires in the pits. Hamilton sets fast lap at 1m40.531s, and closes to 0.7s behind Vettel. Hamilton goes faster the next lap at 1m40.387s. Hamilton closes within DRS zone, and passes Vettel for the lead at the end of the straight. Wehrlein is back in the pits for a second time and retires the Sauber. On lap 7 Verstappen passes Alonso for seventh place. On lap 9 Hartley pits for supersoft tyres. Ricciardo complains that his front tyres are going away. Verstappen passes Ocon for sixth place. At lap 10 Hamilton leads Vettel by 2.4s, followed by Bottas (7.1s), Ricciardo (9.1s), Raikkonen (10.1s), Verstappen (18.5s), Ocon (20.8s), Alonso (24.6s), Sainz (25.8s) and Massa (29.1s) in tenth place. Stroll pits for soft tyres. On lap 12 Vettel complains that his front left tyre is blistering. Ib lap 13 Ricciardo pits changing to supersoft tyres and rejoins in ninth. On lap 13 Ricciardo passes Sainz into turn 1 for eigth place. On lap 15 Ocon and Alonso pit, both switching to soft tyres. Ricciardo sets fast lap at 1m40.102s. On lap 16 Ricciardo rolls to a stop, complaining to the team that the engine is gone. On lap 17 Vettel pits from second place switching to soft tyres and rejoins in fifth place. Hamilton tells the team, "
Kvyat pits for soft tyres. On lap 18 Vettel sets fast lap at 1m39.702s. Bottas pits from second place switching to soft tyres, rejoining in fifth behind Vettel. On lap 20 Hamilton pits from the lead and swiching to soft tyres - Hamilton comes out just ahead of Vettel. Vettel sets another fast lap at 1m39.379s. Raikkonen pits from the lead for soft tyres, handing off the lead to Verstappen, who has yet to pit. Hamilton is closing on Verstappen in the lead. On lap 23 Hamilton passes Verstappen for the lead. McLaren tells Alonso that Perez is closing on him, he responds, "I can see in my mirror, I don't care." On lap 25 Verstappen pits and switches to soft tyres. Alonso complains that he is having an engine issue - Perez pases Alonso for eighth. Alonso pits and retires the McLaren. At lap 25 Hamilton leads Vettel by 3.8s, followed by Bottas (8.2s), Raikkonen (11.3s), Verstappen (20.0s), Massa (38.8s), yet to pit, Ocon (42.3s), Perez ( 44.2s), Sainz (48.4s) and Kvyat (51.0s) in tenth place. On lap 26 Verstappen sets fast lap at 1m38.523s. Stroll, Vandoorne and Hartley are battling for 13th place - Vandoorne passes Stroll. On lap 30 Massa makes his first stop for ultrasoft tyres. Perez is closing on Ocon, telling the team, "we need Esteban to pick up the pace, I am a lot faster." Sainz is closing on Perez in seventh place. Perez tells the team, "Sainz is coming, can you tell Esteban to let me buy and I'll give the position bakc at the end? I have much more pace than him." On lap 34 Sainz passes Perez for seventh place and chases Ocon. At lap 35 Hamilton leads Vettel by 6.4s, followed by Bottas (8.2s), Raikkonen (8.8s), Verstappen (12.0s), Ocon (59.4s), Sainz (62.1s), Perez (63.8s), Kvyat (65.3s) and Grosjean (72.4s) in tenth place. Vettel tells Ferrari, "think about plan B." Maybe looking to pit a second time? Raikkonen is closing on Bottas in third, to under a second behind. On lap 38 Verstappen pits a second time, and switches to supersoft tyres, rejoining still in fifth place, 20 seconds behind Raikkonen. The next lap Vettel pits from second place for a set of new supersoft tyres, rejoining in fouth behind Raikkonen, and ahead of Verstappen. On lap 39 Verstappen sets fast lap at 1m38.060s. Massa passes Grosjean for tenth place. At lap 40 Hamilton leads Bottas by 9.5s, followed by Raikkonen (10.2s), Vettel (24,2s), Verstappen (26.0s), Ocon (69.4s), Sainz (71.2s), Perez (73.8s), Kvyat (75.2s) and Massa (82.9s) in tenth place. Williams tells Massa, "you can catch all these guys, we can have some fun here Felipe!" On lap 43 Raikkonen passes Bottas for second place. Hamilton asks the team, "how are they so close?" Sainz closely follows Ocon for sixth place. In lap 47 Magnussen spins after getting lapped by Vettel, but he continues in 16th. Vettel is closing his gap to Bottaso 2.1s, and sets fast lap at 1m47.957s on lap 48. Sainz is battling with Ocon for sixth. The stewards hand a five-second penalty to Ericsson for causing a collision. Vettel closes to within DRS of Bottas. At lap 50 Hamilton leads Raikkonen by 14.8s. On lap 51 Vettel passes Bottas for third place. Verstappen closes on Botttas. On lap 52 Raikkonen lets his Ferrari team mate Vettel by and he takes second place. On lap 53 Verstappen passes Bottas for fourth place - the two nearly coming together. Bottas immediately dives into the pits and takes a set of ultrasoft tyres, and rejoins still in fifth place. Hamilton continues to lead to the finish ahead of Vettel, Raikkonen and Verstappen. On the last lap Verstappen dives down the inside of Raikkonen and takes away third place. After the finish, the stewards hand Verstappen a five-second penalty for going off-track while passing Raikkonen on the last lap. They tell Verstappen the news as he gets ready to go to the podium, he says ºokay¹, and Raikkonen joins Hamilton and Vettel on the podium. Former US President Bill Clinton hands Hamilton the winner thophy, and Olympic champion Usain Bolt conducts the podium interview.